Accomodation Private bedrooms, most with private shower/wc. All with internet connection and secure entry. Student profile 1.Countries of origin: Students represented from 200 countries. The Business School offers programmes in the fields of Marketing, Law, Management, Business Studies, Economics, Accounting & Finance, Banking, Tourism and Human Resource Management. The School of Art & Education offers programmes in all areas of the Arts (Graphics, Animation, Fashion, Jewellery, Interior Architecture, etc), Performing Arts (Music, Drama and Dance) and Education. The School of Engineering & Information Sciences has four departments with a wide range of programmes in each: Business Information Systems, Computer Communications, Computing and Multimedia Technology and Product Design and Engineering. The School of Health & Social Sciences offers programmes in Sports Science, Biological and Biomedical Science, Psychology, Criminology, Complementary Medicine, Environmental Health, and Health-related programmes. 1. We offer one-year sandwich options for most of our programmes, allowing students to work in supervised ‘placements’ where they gain workplace skills, earn a reasonable salary and work with tutors to contextualise their work with their studies. Our London location offers top jobs in world-class organisations. 2. We offer a wide range of European and international exchanges with world class institutions. 3. Many of our programmes are accredited by professional bodies (eg. Law Society, British Psychological Society, Skillset Media Academy, and many more) to ensure our curricula match the needs of employers. 4. We have a specialist Careers Service to help students and graduates apply for work. Our student body includes over 3,500 students enrolled on undergraduate programmes, over 1,300 students enrolled on taught postgraduate programmes, and 60 doctoral students. In addition, we have around 500 students and clients on short professional courses. We have worked with major corporations to small local businesses in partnerships that include in-house training and development, knowledge transfer and student consultancy projects. Our impressive, newly-refurbished campus is in north-west London, around 20 minutes from the centre of the city. It benefited from more than £66 million in investment recently and includes brand new lecture theatres, seminar rooms, laboratories, social spaces and library. The work of the School is respected both nationally and internationally. Our approach is both liberal and innovative, embracing many contemporary ideas as well as those traditionally associated across the disciplines. Research in the School encompasses electronic arts; fine art; the history and theory of visual culture; architectural design; textiles; fashion and the decorative arts; visual communication and design; performing arts, including dance, music, and theatre studies; philosophy and religious studies, modern language studies, English literary and language studies, communication, culture and media studies; politics and international studies, teacher training and technology education. Our students are highly regarded for their creativity and commitment. Our large range of innovative courses have been designed and are taught by leading artists, designers, writers, media professionals, teachers and researchers to name a few. Our School aims to prepare people for opportunities at the heart of the Arts and Education sector. Major investment in our studios, workshops and teaching facilities make Middlesex a great choice: In the ‘National Student Survey 2006’ students voted Middlesex University Art & Design as the ‘Top London University’ in terms of student satisfaction for our learning resources facilities. The School of Engineering and Information Sciences is one of the largest in the UK, with more than 1000 students from a rich diversity of backgrounds, ages and countries. Research in the School is conducted in many areas but in particular in networks, graphics, databases, systems analysis and human computer interaction, with a large number of doctoral and post doctoral researchers. Both within and outside the research centres are a large number of informal and self-organising research groups, which make it possible for staff and students with shared interests to exchange ideas, information and enthusiasms. Our computer equipment is extensive, ranging from specialist equipment, to workstations, PCs and Macs. Each campus has a library providing areas for private and group study. All our students are encouraged to take responsibility for their own learning and to develop the ability to argue individually and think independently. Group projects help to provide invaluable experience for the workplace. After graduation our students usually pursue computer related careers in the business, industry and financial sectors with many joining software houses or IT departments in large organisations. Last autumn, Middlesex University officially opened its brand new, state-of-the-art biomedical research and teaching laboratories, which will provide the next generation of scientific instrumentation for molecular analysis in the post-genomic era. The facilities will support current scientific research that now focuses on proteomics rather than genomics. Worth £3 million, the analytical laboratories match and in some cases surpass those provided by many UK medical schools, and the recent opening was in stark contrast to high-profile closures of science departments at other universities. 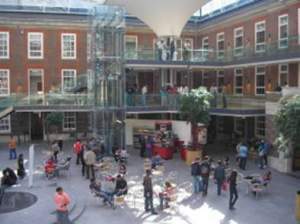 Middlesex aims to be a global University. Based in North London, Middlesex recruits widely across the world, and works in partnership to deliver outstanding higher education in many countries. As well as 25,000 students on our London campuses, we also have over 7,000 students studying on Middlesex University programmes around the world. In 2005 we opened our first overseas campus in Dubai. Since 2000 we have been engaged in a campus redevelopment programme which has seen significant improvements on our main Hendon campus. An ambitious programme of development of the Hendon campus continues. Over the next ten years Middlesex University will develop its role as a leading London-based international university, championing a socially inclusive approach to participation in higher education. We will deliver outstanding academic and training programmes on our campuses in London and around the world, enabling those who choose to study at Middlesex to transform their lives and shape their own futures. We work hard to prepare our students to be professional, skilled individuals fitted for the modern world, committed to lifelong learning and able to contribute to the communities in which they live and work. At Middlesex we always put the needs, welfare and experience of our students first. We place a high value on developing a mature approach to learning in which students are encouraged to challenge conventional wisdom, handle complexity and benefit from difference and diversity. We are pioneers in the development of new knowledge, scholarly understanding and professional practice to promote innovation in the curriculum and support the sustainable development of business and the wider community. We celebrate the rich cultural and international diversity of the University’s community, drawing on its benefits in the design of our programmes. We are committed to an adaptive culture through the development of talented, highly skilled and motivated staff, effective governance, management and leadership and beneficial collaboration with other institutions in London and internationally.